Watch the Video Yes. Dedicated Customer Service Rep. Unlimited support. No phone or email support. Online knowledge base & forums only. Watch the Video Yes. Mobile Friendly Catalog & Checkout. 3rd Party Plug-in. Watch the Video Yes. Add on Module. Automated Review Reminders Yes. Must install seperate module. Reliability Nexternal hosts and maintains the application with 24/7 monitoring. Zen Cart is hosted by a third party. Reliability varies. Software Updates Automatic and frequent. Merchant must download and install. Marketplace Feeds Automated - run daily. Must manually create and submit data files. Multiple Ship To Yes. No. Inventory Kits/Product Bundles Supported Not supported. Trust Guard Yes. Scanned daily. Merchants can display badge. Not included with Zen Cart. Multiple Admin Access Levels Yes. 7 different access levels. Not standard. Need to install add-on module. Zen Cart is a Trademark of Zen Ventures, LLC. 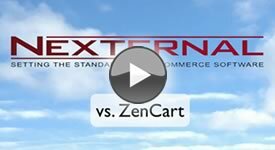 Information was collected from Zen Cart's website (www.zen-cart.com) in order to compare it to Nexternal's shopping cart application. To report an error or discrepancy, please email .